Entertain your friends with a fantastic Brunch! Brunch is my very favorite way of entertaining my friends and family. It has such flexibility. You can be as simple as to make fresh fruit and eggs or step it up and serve pastries or seafood. Since brunch is a combination of breakfast and lunch, your ideas are endless. I am going to give you recipes for 2 of my very favorite brunch items. Explore, test, prepare and then entertain your guests with a beautiful array of the best foods brunch has to offer. 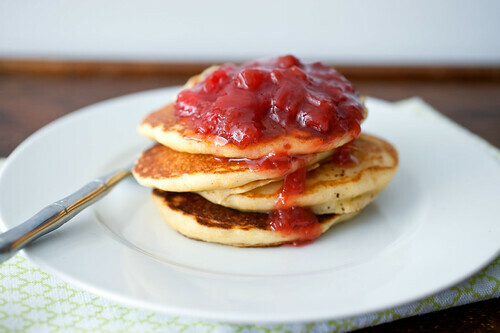 This recipe makes more compote than you’ll have pancakes. I stayed true to the recipe as written. Refrigerate until needed. Can be made up to 3 days ahead. Rhubarb Compote from the refrigerator and set it aside. just warm it until you see tiny bubbles at the surface. until ready to add to the batter. 1 minute to ensure that the ingredients are well combined. and either whisk or stir gently until the batter is just combined. it will give you the fluffiest pancakes imaginable. 1/4-cup scoop, gently place the batter onto the griddle. will start to pop and not close up, about 3 minutes. and keep in the oven while you cook the rest of the pancakes. or warm maple syrup and fresh fruit of your choice. 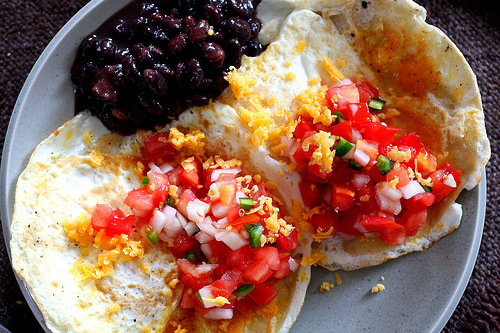 The Best Huevos Ranchero Recipe Ever! First, let me get my “semi-homemade” moment out of the way and I start by opening a can of beans, but by “beans” I mean Goya’s black bean soup, and no, I don’t feel bad about it. This is my favorite-est shortcut–these guys are so perfect right out of the can–with just the right amount of liquid–I see no reason to trouble myself with cooking and seasoning my own. Or at least not when I have a quick meal in mind. Next I make a quick salsa fresca with diced tomatoes, some red onion, a minced jalapeno, salt and a good squeeze or two of lime juice. If you’re the cilantro type, you can mix that in as well. With tomatoes in high season right now, you’ll think you’ve died and gone to heaven. First you heat a 6-inch corn tortilla in an oiled pan. Sprinkle some shredded cheddar over the browned side and let it melt a bit. I like to use about half an ounce per tortilla. Break a single egg over the melting cheese. Don’t worry if it rolls over the edges, that’s all part of the tasty mess of it. Season it with salt and pepper. When the white is about halfway set (i.e., the edges and some of the egg on the tortilla), flip the whole thing over. For me, this is when the mess always strikes as the yolk is just itching to run off the spatula as I flip it. Cook it for a few minutes on the other side, flip it back onto a plate and you’re done. All there is left to do is decorate. If you’re Alex, that means a tidy arrangement of salsa fresca, beans, cilantro when we have it, salsa from a jar, extra and several shakes of Tabasco. For me, this means a scattered mess of salsa fresca, beans and sour cream, everything muddling together in a glorious tangle of things that are delicious. 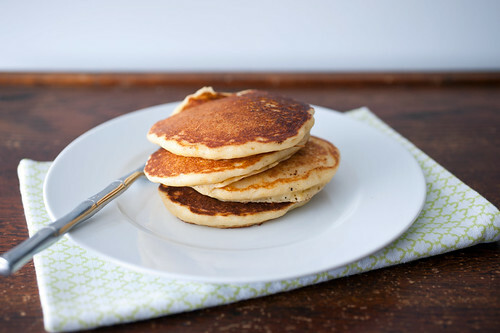 I have served and enjoyed your pancake recipe dozens of times as it is my favorite. Delighted to get to share it. Thank you! These look so good. I’m really getting into rhubarb recently and will be trying these!!! Linda, I hope you enjoy this recipe, Thank you!